For the last couple of weeks, we have been examining the Io-abstracts submitted for next month's Lunar and Planetary Science Conference. Today we take a look at a paper submitted by Alfred McEwen and a host of co-authors from the IVO team titled, "Science Rationale for an Io Volcano Observer (IVO) Mission." For this paper, McEwen discusses the technology and science goals and objectives for the proposed Io Discovery mission. McEwen also touches on how IVO could expand on our knowledge of Io beyond what Galileo obtained in the late 1990s and early 2000s and what the Jupiter Europa Orbiter (JEO) will get in the late 2020s. This research will be presented as a poster at the Mission Plans and Concepts session on Tuesday, March 2. We've discussed this proposed mission a number of times in the past. The Io Volcano Observer mission concept was first developed as part of NASA's Discovery & Scout Mission Capability Extension (DSMCE) program. In this study, NASA hoped to get better grasp on what could be done within the Discovery/Mars Scout program cost cap if the missions were provided two, government-provided radioisotope power sources. NASA's goal is to test the new Advanced Stirling Radioisotope Generator (ASRG) power source on one of these low-cost missions. The ASRGs are a much more efficient power source than current RTGs, making them a smarter choice given the limited amount of plutonium available going forward. 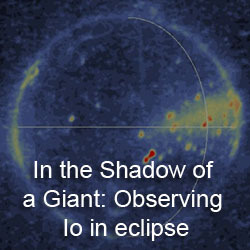 The Io Volcano Observer (IVO) was one of nine mission concepts that were selected for further study for the DSMCE program; that study was completed back in February 2009. A1 - Understanding Io's current active volcanism by understanding how its active lavas and plumes are emplaced and generated. The team plans to acquired repeated imagery of the same volcanic sites at global scales and at high-resolution (< 10 meters per pixel) in order to monitor changes at these volcanoes. They also plan to take movies of dynamic phenomena like plumes as well as make in situ mass spectra of plume material and Io's atmosphere. A2 - Understand Io's internal structure and tidal heating mechanisms. The IVO team will use electromagnetic sounding of Io's induced magnetic field and lava temperature measurements to measure the amount of partial melting in Io's asthenosphere. Thermal mapping in the mid-infrared (~15-20 microns) will allow the group to map Io's heat flow. The distribution of thermal sources on Io could help distinguish the region of tidal heating in Io's mantle, whether it is in the asthenosphere or in the deep mantle close to the core. 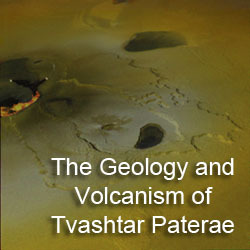 B1 - Investigate the processes that form Io’s mountains and paterae and the implications for tectonics under high-heat-flow conditions that may have existed early in the history of other planets. 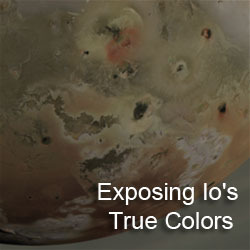 This will be accomplished through high resolution stereo mapping of large portions of Io's surface, with particular emphasis on areas where we already have at least medium resolution imagery, in order to look for topographic changes on a time-scale of decades (42 years between Voyager 1 and the arrival of IVO in 2021). B2 - Understand how Io affects the Jupiter system. They plan to accomplish this through in situ measurements of the composition of Ionian volcanic products, Io's atmosphere, and the plasma and neutrals in near-Io space. They also plan to study how Ionian material is lost to Jupiter's magnetosphere. Finally, they will remotely monitor Io's sulfur dioxide atmosphere and Na-D and OI emissions. B3 - Search for evidence for activity in Io's core and deep mantle by looking for an internal magnetic field in addition to the induced field discovered last year. Resolving the conundrum of why Io can be so active and not have an intrinsic field might help us better understand how planetary magnetosphere are created. They also plan to investigate the neutral and plasma densities and energy flows in the Io plasma torus, plus their variations over time, and characterize the ionic radiation belts in the vicinity of Io and their influence on the surface. In addition to these science goals, a major technology goal for this mission is to study the effectiveness of the new ASRGs. One way to accomplish this is to extend the life of the mission past its primary mission of 7-8 years (including cruise to Jupiter and Io). They could either expand IVO's orbital period to 1 year to test the ASRGs for their entire nominal lifetimes (~14 years), or they could tighten the orbits to test how well the ASRGs handle the Jovian radiation environment. ASRGs are needed for an Io mission as the rapid flybys require fast turn times, which a non-gimbaled solar panel wouldn't support and a gimbaled solar panel may not be stable enough and too expensive for a Discovery-class mission. The inclined orbits of IVO would result in low doses per flyby (10 krads compared to 85 krads for the average JEO flyby), so that actually wouldn't be the limiting factor for a solar-paneled Io mission, the high turn rates and high data rates during the encounters would be. Finally, the IVO team compare the possible science generated by the Io Volcano Observer and other missions to Io: Galileo and the Europa/Jupiter System Mission. Galileo's instruments were designed before the discovery of volcanism on Io so the camera and near-infrared spectrometer were not optimized to take advantage of this discovery, and the limited downlink bandwidth brought on by the high-gain antenna failure didn't help. Compared to the Jupiter Europa Orbiter, IVO would fly over Io's polar regions, mapping the heat flow in those areas and performing sounding of Io's induced magnetic field. The instruments can also be designed to specifically perform measurements needed for Io that might not be possible with those on the Jupiter Europa Orbiter, such as the near-simultaneous color imaging needed for color measurements. JEO would accomplish some Io science that would be complementary to that of IVO, such as ground-penetrating radar and laser altimetry. One interesting possibility is a simultaneous close-up observation with both IVO and JEO. 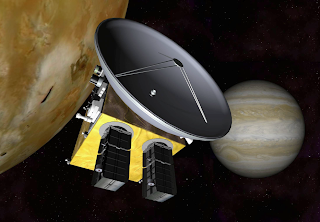 If IVO's mission at Jupiter and Io is extended with year-long orbits, its extended mission could overlap with the Europa/Jupiter System Mission. To me, this would be above and beyond the best Discovery concept out there.